The cancelation of the scheduled dinner in Vienna, as reported by Fars, was intended to protest Ashton's “uncoordinated meetings in Tehran,” a reference to her meeting with female human rights activists; including Nasrin Sotoudeh, a human rights lawyer who has represented members of the Iranian opposition, and for which she has been imprisoned herself. Zarif who has said he was ready to talk to members of opposition in Syria, and regularly meet with opposition parties in Western Europe, cannot accept that any foreign politician could meet with the Iran’s opposition. The Iranian government apparently believes either there is no opposition inside the country, or wished that the problem went away. But it doesn’t work that way! Imagine the pressure, thought control, intimidation and coercion they try on average Iranians. Life in Iran is pure hell from morning to night. It's amazing Iranians can tolerate it. Could you imagine Kerry refusing to have dinner with someone because they met with the Tea Party or with Republicans? What an insecure leader Khamenei and his family of thieves are, and rightfully so, because they know most of the people hate them. You better get in line Khamenei, you pathetic nothing, or the sanctions will prevent your son and family and Sedat from enjoying all that money you stole. Filthy cockroach. Yeah, very immature on Zarif's part. He should instead met with the families of imprisoned holocaust researchers and issued a statement about the illegitimacy of any government that feels it needs to monopolize history. I'm sure the Europeans would have taken that well. 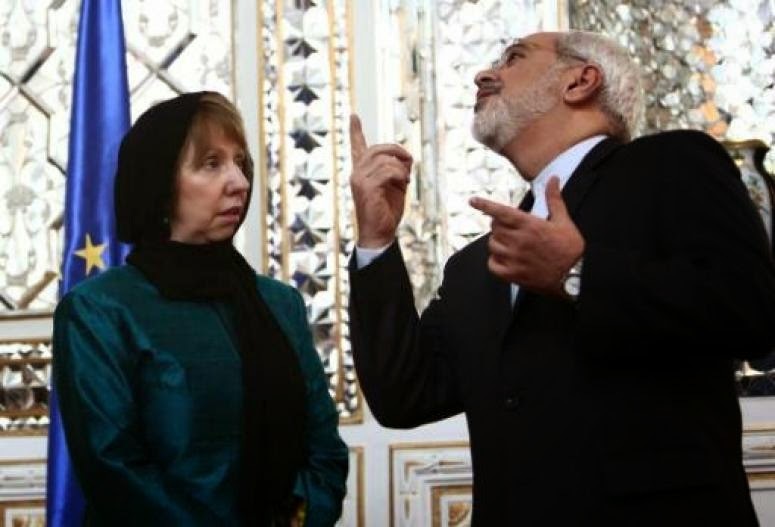 What is Zarif pointing at? Just imagine what would happen here in our country, the United States, if on an official visit Lavrov visited the family of Edward Snowden. FSB asset, Edward Snowden, is currently under the supervision of his Russian intelligence handlers. You were saying? What kind of person laughs at the suffering of Iranians, as you sit in the West, by grasping for such absurd analogies? "don't blame the mullahs, blame the Jews"
How pathetic of a culture. If you wanted to use a Russian example, the more appropriate was Andrei Sakharov. He was at top of his profession, as Sotoudeh is now, during his years as an activist. In 1985, after a long hunger strike, much like Sotoudeh during her detention, our diplomats facilitated visits at his hospital and finally got the permission from the Soviets to bring him to the U.S. for treatment. He remained here until Gorbachev came to power, and returned to Moscow at his invitation. I believe you was never in countries like Afghanistan, Pakistan, Irak.